At a press conference from its Round Rock headquarters this morning, AMD made good on one of its most important promised milestones: It's preparing to deliver its six-core Opteron server processors, which will beat Intel to market with the first drop-in six-cores for 4P and 8P configurations. 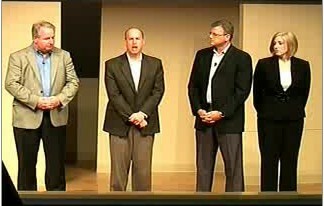 Shipping, according to executives, begins now. Intel isn't expected to have Nehalem generation EP- and EX-class Xeon processors in configurations other than 2P until sometime next year. As the company's server business director John Fruehe told reporters this afternoon, this new class of six-core Opteron will feature a new element of its HyperTransport bus, called HT Assist. As Fruehe explained, this feature will enable all the processors in a multi-way configuration to share portions of their L3 cache as a pooled lookup table. This way, calls to the table are directed to the appropriate processor, even across processors. The promise here is to dramatically reduce crosstalk and traffic, and cut stream memory bandwidth by as much as 30%. AMD needs as many weaknesses on Intel's side as it can find, and this morning, it focused an intense spotlight on Intel's 2P and, in some cases (Dunnington), 4P limitations for the Nehalem generation. "Who uses a $15,000 2P server these days?" Fruehe asked, obviously relatively. "No one." 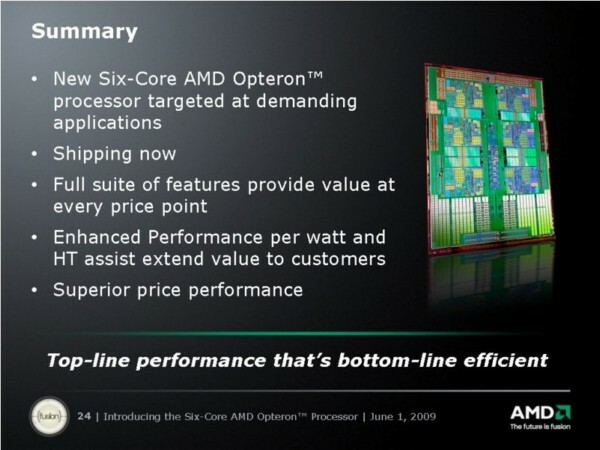 5:14 pm EDT June 1, 2009 - Over the past three years, since Intel's introduction of Core Microarchitecture, AMD has been in the habit of professing that it has been listening to its customer, and whatever it is that the customer needs happens to be whatever AMD presently produces. Some days, the company might be right. The rest of the time, it's been something of a stretch, including the day two years ago, amid the worst days of Barcelona's lackluster performance, when AMD openly argued customers don't really want performance anyway. Certainly if there's an exception to that argument, it's in the server space, and AMD's July 2007 dance around that exception was now almost famously ineffective. This morning, AMD is in a position where it must produce a higher performance chip for every market segment, or else become relegated to the scrap heap of history along with Transmeta. So now that AMD is more comfortable with what it's seeing from its Istanbul product line, what is it that server customers want? Startlingly, something that looks a lot like Istanbul. "What we see with our customers is that the server market is bifurcating," stated AMD Vice President of Product Marketing Leslie Sobon this morning. "And we have two sets of server customers who are looking to optimize on different things. The first set wants to optimize on performance and expandability -- HPC, ERP, and other databases and virtualization -- and they need maximum performance, and they need to make sure they have the expandability to grow with that performance and those workloads." The second group, Sobon continued, is looking for a more energy-efficient platform that's better suited to highly concentrated environments such as server farms. "So that's how we translate the usage-based platforms into exact offerings that we have, in where we see the server market today and in the future," she added rather truthfully. Certainly the big news today is that AMD is delivering six-core server processors as it promised last month, and that in at least one respect, it is one-upping Intel. So it was almost nostalgic to see John Fruehe, the company's server business director, talking smartly about its competition as though this were 2005. "Not every processor manufacturer thinks the way that AMD does," said Fruehe, as though there were anyone else in this market today besides Intel. "Sometimes they think that maybe customers don't want to have a consistent set of features across all their processors. Maybe they like to play the guessing game instead. If you look at how our products stack up relative to our competitors', in terms of features, you see a very clear trend happening. On the AMD side, whether it's memory speed, bus speed, cache, or AMD-P or AMD-V functionality, you see consistency across the line. Now, if you work in a data center, you know that you're constantly deploying servers for different functions. You're going to use different speeds of processors, you want to make sure that all the features and all the capabilities you expect to have there, are actually going to be in that processor." For example, he said, the fact that AMD-V is supported consistently across the product line means that in virtualization scenarios, the software image can easily migrate between processors. Fruehe took the opportunity to play "kick-the-can" with Dunnington, the first and last series of six-core Intel Xeon processors to use a stand-alone memory controller with front-side bus, prior to the Nehalem era. One reporter this morning asked whether AMD's six-core unveiling was too late, given the fact that Intel had a six-core part shipping as early as last September. "Intel did bring Dunnington to market first. It was a six-core product, it was big, it was hot, and it was slower," Fruehe remarked, casting a few statements in the general direction of unnamed tests showing Dunnington to have been slower than a quad-core Shanghai part. "You have 24 cores all vying for a single memory controller. The types of applications that customers would want a six-core, four-way server on are things like virtualization, large databases, ERP applications, and those are all areas where you want high amounts of memory throughput, which is why the adoption of Dunnington really hasn't come along as they had hoped." AMD's value proposition does look competitive, and even enticing: As with its new quad-core Opterons, it's dividing its initial six-core spectrum into the high-performance 8400 series and "value conscious" 2400 series. Right now, the six-core 2.6 GHz 45 nm model 8435 sells for $2,649 in 1,000-unit quantities ("trays"). On Intel's side of the picture, as of May 10, its 2.66 GHz 45 nm six-core X7460 (with the "X" typically standing for "hot," sometimes in the wrong places) sells for $2,729. And while Intel's most recent product price list (PDF available here) does not list a six-core part any less expensive than $2,301, AMD is pricing its bargain six-core 2.2 GHz model 2427 at $455. It may not necessarily be the "crack in the dam" just yet, but it is a crack in something, and AMD is going to drive a wedge into it as hard as it can.